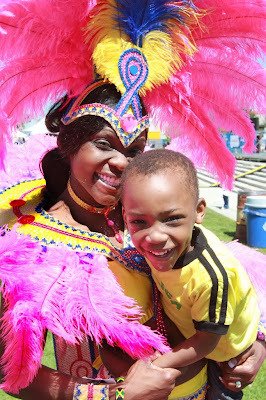 Denise and her 3 year old boy Ojore Lynch celebrate Carifest at Shaw Millenium Park in Calgary on Saturday. The carnival was back in town Saturday. After years of rain and a recession knocked their colourful, boisterous parade out of commission in 2009, the Carifest Parade was back Saturday, after a one-year hiatus. As a result, the hundreds of participants, many of whom dressed in brilliant, colourful, hand-stitched costumes, turned downtown Calgary, for a couple of hours anyway, into a scene that resembled something out of Trinidad or Jamaica during Mardi Gras more than its usual identity as the home of corporate Calgary. There were hundreds of jubilant marchers dressed in elaborately hued, hand-stitched costumes, such as the pink and yellow extravaganzas worn by the Sykotik Mass, who looked brilliant in the glorious afternoon sunshine that swept across thousands of revellers who gathered afterward in Shaw Millennium Park to celebrate Carifest. Andrea Harris, whose hair was adorned with pink feathers and her cheeks with gold glitter, explained that the reason the parade reminded a viewer of Carnival is because that's what parade organizers were trying to do. "It is Carnival!" Harris said. "We're just trying to build awareness of Caribbean culture in Calgary." Harris was asked what it mean to be back marching in a Carifest Parade after a year's absence. "I had a lot of fun," she said. "It was amazing. Last year we didn't have it (the parade) at all, so this is especially nice." This year's Carifest featured a change of venue, to Shaw Millennium Park, from the 2009 event, which took place in Olympic Plaza. 12 year old Deneka Squire said it was a change for the better -- even if she wasn't sure why. "It's just better," Squire said. "People enjoy it here." By early afternoon, the park was already quite busy, with long lineups at vendors such as Monty's Crab Shack waiting patiently for various Caribbean-themed treats. The only dissenting voice came from Harris's fellow Sykotik, Denise Lynch, a longtime (17 years) Calgarian from Jamaica who owns the Blue Lagoon Restaurant. "Look at this (beautiful scene)," Lynch said. 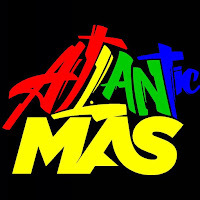 "I just wish more of the Caribbean community would come out for this. I've been living here 17 years, and there's been a lot of migration of Caribbean people from Toronto and Montreal over the last few years. "Calgary has grown so much within its Caribbean community," she added. "But I don't see a lot of them here. We have a good vibrant parade. They should be here to celebrate it!"